The U.S. Food and Drug Administration has now published the long-awaited small entity compliance guide (SECG) for very small firms under the current Good Manufacturing Practices (cGMPs) for dietary supplements (21 CFR Part 111). The guidance was developed by the agency in conjunction with the staggered phase in of the rule based on firm size to limit disruption to small businesses. The SECG was the only guidance that was committed to by the agency in the publication of the final rule. The Natural Products Association will review the guidance, and quickly share with NPA members our analysis of the most important aspects. The Natural Products Association has long been a leader in the GMP arena. NPA were first in the industry to hold GMP education; offering a webinar within 48 hours of the publication of the final rule, and in-person training two weeks following its publication. Please look for NPA to uphold our tradition of excellence in GMP information and education. Support NPF while you shop this Holiday Season! This holiday season there are two great ways for you to help support the Foundation while giving great gifts! By shopping Amazon.com or Tastebook.com, you have access to unlimited stores of books, electronics, clothes, and other fabulous presents. NPF and Tastebook have partnered to give you an incredible new cookbook: Cooking Naturally. NPF is pleased to present this well balanced set of recipes, specifically tailored for all the natural cooks out there. Cooking Naturally is a collection of savory recipes and gorgeous photography that's truly one-of-a-kind, a wonderful, personalized gift! These dishes are healthy, diverse, and sure to give you some amazing ideas for a cuisine as natural as it is delicious. We think you and yours will find it to be not only a great complement to any natural lifestyle, but also a wonderful way to shake up your cooking routine. To begin Cooking Naturally, please click here: The Natural Products Foundation Tastebook and be sure to enter NATURALPRO in the coupon box at checkout. Proceeds benefit the Natural Products Foundation. Access Amazon.com through the Natural Products Foundation and a portion of your total purchase price comes back to support Foundation activities. That’s right, just by accessing Amazon.com through NPF and making a purchase, you’re helping to support your industry. It couldn't be easier. Simply click on any item listed for sale on the NPF websites naturalproductsfoundation.org and naturalproductsinfo.org and you’ll be taken to Amazon.com. The Natural Products Foundation will get a portion of the purchase price of everything you buy on the site! So the next time you want to make any purchase through Amazon.com, access the site through the Foundation websites. Whether you're purchasing books, electronics, movies, music, clothing, or anything at all that Amazon.com offers, you will be helping to maintain our industry's vitality as well. November 9, 2010 — (Washington, D. C.) The Natural Products Foundation (NPF) announced today the election of David Brown as the newest member to the organization's Board of Directors. Mr. Brown was unanimously elected to the position, and will join the Foundation’s governing body effective immediately for a three-year term. David Brown has a career spanning nearly twenty years as a corporate lawyer and President and CEO in the nutrition industry. He is the current President and CEO of LifeVantage Corporation, a position he has held since January 2008. LifeVantage Corporation (OTCBB: LFVN) is a dietary supplement company which markets and sells its products through the network marketing, or multi-level marketing, industry (www.lifevantage.com). Prior to his work with LifeVantage, Mr. Brown had been the Managing Director and Co-Founder of Nutritional Business Advisors, a firm founded to provide strategic consulting services. Previously, Mr. Brown acted as the President and CEO of Metabolife International, and served as President of Natural Balance, Incorporated. Mr. Brown earned his Juris Doctor degree from Cornell University and his Bachelor of Arts from Brigham Young University. He began his career as a corporate attorney at the law firm Kindel & Anderson. NPA plans to further expand its online presence next year through other social media like blogs, LinkedIn and YouTube. For more information about NPA and natural products, visit www.npainfo.org. WASHINGTON, D.C. – The Natural Products Association (NPA) is offering another resource to help retailers stay within the legal limits of dietary supplement claims. The NPA Retailer’s Staff Education Toolkit can be used to educate retail staff about what should and should not be discussed with customers. The toolkit also contains customer-friendly materials for stores. The toolkit is currently available only to NPA members, though the association plans to provide a version of the toolkit for all retailers. Learn how to join NPA at www.npainfo.org. FDA handbook that explains government regulations and permitted information about dietary supplements. It also provides guidance on how to handle FDA inspections and what third-party information may be given to customers. Brochure with a summarized version of the most important areas covered in the handbook. Wallet card that staff can use for quick reference on the key points to remember when discussing dietary supplements. Shelf talker that details the type of verbal and print information customers can expect to receive. Flyer with a brief overview of federal regulations for dietary supplements and the information that can be offered in the store. Poster that tells how staff may help them. NPA will continue to assist retailers in other ways, including live sessions at trade shows, webinars and teleconferences; partnerships with industry media; and regular content for sales staff in NPA publications. For more information about NPA and dietary supplements, visit www.npainfo.org. September 22, 2010 (Washington, D. C.) — As part of its successful Truth in Advertising program, the Natural Products Foundation last week met with officials from the U.S. Federal Trade Commission (FTC) to discuss enforcement of dietary supplement advertising standards. The Foundation’s Truth in Advertising program, a unique, industry-supported project, has issued fifty-five warning letters since January. Most companies receiving the letters have responded in a positive fashion, correcting problems identified by the Foundation. During the meeting with FTC representatives, Gay discussed the Foundation’s willingness to lead the self-regulatory program. Gay also discussed the need for support from the FTC to address problems that could not be resolved in a collegial manner. The Truth in Advertising Program has received broad support from industry insiders and federal representatives. Extensive educational information is provided on the Foundation’s website to assist companies in need of guidance: Truth in Advertising Resources. Companies that want to proactively become members of the Truth in Advertising program can take the foundation’s pledge: Truth in Advertising Pledge. For more information about the Natural Product Foundation’s Truth in Advertising program, contact executive director Deb Knowles at 941-349-9044 or debknowles@naturalproductsfoundation.org. The Congressional Dietary Supplement Caucus (DSC), in cooperation with two leading trade associations representing the dietary supplement industry, the Natural Products Association (NPA), and the Council for Responsible Nutrition (CRN) held a briefing on Capitol Hill yesterday to debunk some of the untruths and misconceptions about the dietary supplement industry and its role in Americans’ wellness regimens. “It’s all about prevention. Prevention is the new mantra among consumers,” said guest speaker Patrick Rea, publisher and editorial director of Nutrition Business Journal (NBJ), a market research, publishing and consulting firm serving the nutrition, natural products and alternative health care industries. Speaking to an audience of staff members from the U.S. House and Senate, Rea said that even during tough economic times, consumers turn to dietary supplements as an important part of their immunity and prevention plan. “Consumers looked at supplements as one way through the recession to help take care of themselves. Health is recession resilient, and the sales over time support this fact,” said Rea. Rea cut through some of the misconceptions and rhetoric too frequently reported as fact, and offered a true view of the state of the industry. He directly addressed several of what he called “industry myths” –that dietary supplements are unnecessary because people get what they need from food; that people really do not want to take supplements; that the pharmaceutical industry will destroy the dietary supplement industry; and that the industry is unregulated. Rea shared solid sales and product trend data that refuted each myth, and explained in depth how an aging but influential population is changing the way Americans use and rely on dietary supplements. Dietary supplements are part of a nearly $27 billion industry that has demonstrated steady sales and product growth over time. “Our numbers show that somewhere between 60-80 percent of Americans take supplements, and 48 percent of them consider themselves regular users,” said Rea. Rea also mentioned the growing acceptance of dietary supplements among conventional health practitioners, and the growing trend among pharmaceutical companies to develop their own versions of products usually sold as supplements. “In a study of healthcare professionals, 72 percent of physicians and 89 percent of nurses are dietary supplement consumers, and 79 percent of physicians and 82 percent of nurses recommend dietary supplements to their patients,” said Rea. Rea concluded by disputing the myth that the industry is unregulated. “The supplement industry is one of the more highly regulated industries. Many of the companies say the regulatory challenges they face today are the threat of increased FDA and FTC regulation over the industry, and the recent GMP [good manufacturing practices] rollout. A lot of the companies are rallying behind the GMP regulations. They want it to be known that they are a GMP-compliant company. And, the Dietary Supplement Health Education Act [DSHEA] made claims rules clear and has really helped the industry focus and develop,” said Rea. “What is the truth about the dietary supplement industry? There is a lot of investment in science, and a lot of movement by companies to ensure they’re up to speed on the regulatory front.” said Rea. Over the past month, we have seen a wave of publicity surrounding dietary supplements stories in the media. The Natural Products Foundation would like to take this opportunity to highlight a series of studies commissioned by the Dietary Supplement Education Alliance, which was merged into the Natural Products Foundation. Appropriate use of calcium with vitamin D for the Medicare population shows potential avoidance of approximately 776,000 hospitalizations for hip fractures over five years, as well as avoidance of stays in skilled nursing facilities for some proportion of patients. The five-year (2008-2012) estimated net cost associated with avoidable hospitalization for hip fracture is approximately $16.1 billion. The Health Impact Studies were conducted in stages over a number of years, resulting in four reports. The first Health Impact Study examined five supplements: calcium (with vitamin D), folic acid, omega-3 fatty acids, glucosamine and saw palmetto. The study concluded that the reduction of hip fractures through calcium intake alone could save the health care industry approximately $13.9 billion through a reduction in hospital, nursing facility and physician expenditures. Folic Acid intake for sufferers of neural tube defects (NTD) over five years could save approximately $1.3 billion in lifetime costs. Research on the other supplements was similarly promising. The second Health Impact Study chose for its focus the health of senior citizens over the age of 65. The supplements studied were omega-3 fatty acids, for their role in decreasing rates of coronary heart disease, and lutein with zeaxanthin, for reducing levels of age-related macular degeneration. As with the initial study, the findings were overwhelmingly positive: with the intake of omega-3 fatty acids, $3.1 billion could be saved over five years, with 384,303 CHD-related hospitalizations avoided. With lutein with zeaxanthin, $2.5 billion could be saved through avoiding greater dependency and admission to nursing care facilities necessitated by the loss of sight. For the third study, the Lewin Group were instructed to examine the potential benefits of dietary supplements for diabetics. The study found that diabetics, 34% of whom currently take dietary supplements regularly, report themselves in significantly better health than diabetics who do not take supplements. Diabetic supplement users also reported being in better health than a year ago, and are more likely than diabetics who do not take dietary supplements to engage in other protective health behaviors, such as refraining from alcohol and consistently managing glucose levels. The fourth Health Impact Study updated earlier analyses with new studies by the Lewin group and its experts, finding that just a handful of dietary supplements (calcium with vitamin D, folic acid, omega-3 fatty acids and lutein with zeaxanthin)could save the U.S. health care system over $24 billion over a five year period. This includes savings of approximately $16.1 billion through the use of calcium with vitamin D, $3.2 billion from omega-3 fatty acids, $3.6 billion from lutein with zeaxanthin, and $1.4 billion from folic acid. Since meeting with federal regulators late last year, the Natural Products Foundation’s Truth in Advertising program has addressed 50 individual cases of non-compliant advertising practices so far in 2010. Primarily concerned with supplement ads that claim to treat or mitigate disease, NPF continues to take decisive action to eliminate unscrupulous promotions that undermine the good reputation of the natural products industry. By following the guidelines laid out for the industry under the Federal Food, Drug, and Cosmetic Act (FD&C Act) as amended by the Dietary Supplement Health and Education Act (DSHEA), the Foundation is helping advertisers, retailers, suppliers, and publishers to present accurate, honest advertising. You can show your support for truthful advertising right now by signing the NPF Truth in Advertising Pledge: Take the Truth in Advertising Pledge! The latest edition of Consumer Reports is an attack on dietary supplements -- including a call for additional regulation of the industry -- that presents a far from balanced and accurate representation of the industry or the laws that regulate it. The NPA questions the data Consumer Reports are using to suggest the dietary supplement industry suffers from inadequate quality controls. In actuality, evidence from the government suggests the contrary. Earlier this year, the U.S. Government Accountability Office (GAO) tested a number of products finding only trace amounts of contaminants, leading the FDA to testify before Congress that “we do not believe these levels represent a significant risk to health.” It is curious that Consumers Union, publisher of Consumer Reports and also a witness at that hearing, did not mention this testimony in the article. The U.S. supplement industry has an enviable safety record, especially when compared with other FDA-regulated sectors, and the industry has supported and continues to support measures to make supplements even safer. NPA supported enactment of the Dietary Supplement Health and Education Act (DSHEA). NPA supported enactment of the legislation creating the Adverse Event Reporting system. NPA supported implementation by the Food and Drug Administration of Good Manufacturing Practices, even launching our own GMP certification program in 1999. NPA supports the full implementation of DSHEA - including providing additional resources for these agencies. To that end, NPA endorses S. 3414, the Dietary Supplement Full Implementation and Enforcement Act of 2010, introduced by Sen. Tom Harkin (D-IA) and Sen. Orrin Hatch (R-UT). July 21, 2010 — (Washington, D. C.) The Natural Products Foundation (NPF) announced today the election of two executive officers from the organization's board of directors. David Matteson has been elected Treasurer of the Foundation, and J.D. Weir has been elected Secretary. Mr. Matteson has dedicated his career to advancing healthy ideas, services, and products into the marketplace. He is the co-founder of pH Sciences, and focuses his creative energy on his consulting practice, Early-Edge Solutions. Matteson serves on a variety of national advisory boards that strive to ensure consumer access and choice to effective healthcare services and healthy products. He holds academic degrees in biology/engineering, education, public health, and public policy and planning. Mr. Weir is the President and CEO of Primus Pharmaceuticals. In the past, Weir has led various prescription and OTC drug and medical device businesses for Procter & Gamble (P&G) and later The Kendall Company’s former home healthcare subsidiary, Kendall-Futuro. At Kendall-Futuro, Mr. Weir was the Vice President of Marketing & Product Development. He has extensive experience in entrepreneurial management, marketing, sales, and product development. He graduated from Harvard Business School with an MBA and from Augustana College with a BS in Business and Accounting. “With the election of David Matteson and J.D. Weir to the executive branch of our board of directors, the Foundation is primed to move forward in the pursuit of our goals," said Derek Hall, Board Chairman of the Natural Products Foundation and CEO of Qivana. "Through their long personal involvement within the industry, Mr. Matteson and Mr. Weir have made major contributions to the public success of natural products. David and J.D. are perfectly suited to help guide our organization to continued growth and improvement over the coming year. Their leadership will be invaluable, and we are very pleased to have them as part of our executive committee." In another victory for Natural Products Association (NPA) members and the industry, early this morning, conferees on the Wall Street Reform bill (S. 3217) decided not to include in the final legislation sweeping new powers for the Federal Trade Commission. Such additional authority very likely would have led to advertising rules on the industry that would have undercut the protections of the Dietary Supplement Health and Education Act (DSHEA). In the last two months, over 28,000 messages were sent to Capitol Hill through the association’s web site, NPAinfo.org. Since identifying this issue as a potential threat to the industry in December, NPA joined together with what eventually became a coalition of over fifty national trade associations. Through the coalition, NPA lobbied members of Congress, and ran ads in Capitol Hill publications. In addition, NPA was by far the leading organization in producing grassroots contacts with senators and representatives. “Some of our members might have gotten tired of hearing from us on this issue, but sometimes in Washington persistence pays off,” said Gay. June 17, 2010 — (Washington, D. C.) The Natural Products Foundation (NPF) announced today the election of Derek Hall as chairman of the organization's board of directors. Mr. Hall was elected to a one year term as chairman at the Foundation's annual meeting at Natural MarketPlace on June 11. Mr. Hall, who served as NPF Treasurer during 2009-2010, is an industry veteran with a history of executive experience. He is a founder and CEO of Qivana, a network marketing company offering dietary supplement products. Previously, he has served as President and CEO of Nature's Way, Botanicals International, Integrative Therapeutics, Unigen USA and Univera. In addition, he served as Vice-President and CEO of ECONET, Inc.
June 3, 2010 - Washington, D. C. — The Natural Products Foundation (NPF) announced today that Deborah Knowles has been named executive director of the organization. “I am delighted Deb has agreed to serve as Executive Director. She has the expertise and the vision to help the Foundation reach its greatest potential,” said John Gay, president of the Natural Products Foundation and executive director and CEO of the Natural Products Association. 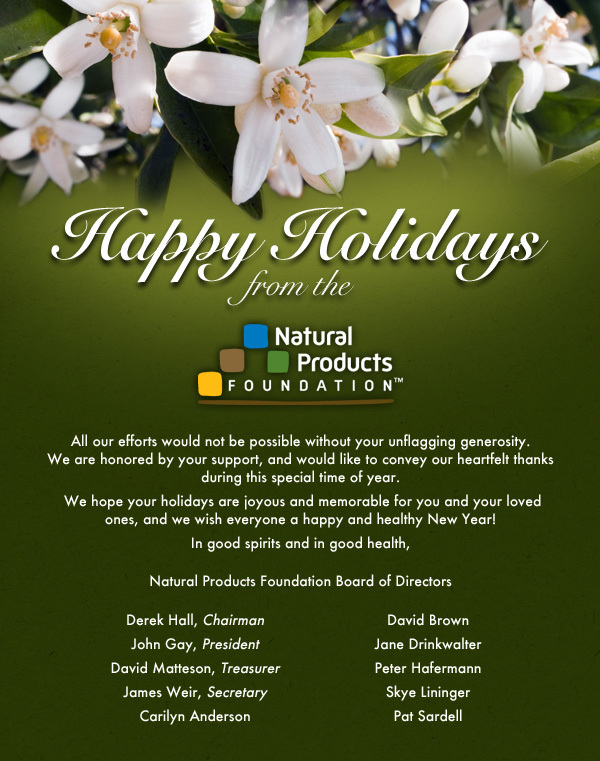 “From her initial experience with the Dietary Supplement Education Alliance, which became part of NPF in 2008, to our present day operations, Deb has consistently demonstrated her commitment to our mission.” The Natural Products Foundation's mission is to enhance and promote the integrity of natural products through quality, science and education. Knowles was most recently the director of development at the Natural Products Foundation, after joining NPF with the Dietary Supplement Education Alliance (DSEA). She is a health industry veteran, with many years of experience working in management and consulting positions. Her background includes the start-up, development and sale of two successful companies focused on health care cost management. She received her MBA from Cornell University. June 1, 2010 — (Washington, D. C.) The Natural Products Foundation (NPF) has elected six new members to the organization's board of directors. All six were unanimously elected to three year terms on the organization's governing body. The newly elected members of the board are Carilyn Anderson, Sales Executive for Carlson Labs, Arlington Heights, Illinois; Jane Drinkwalter, Vice President of Sales for Vitamer Labs, Irvine, California; Peter Hafermann, President of Alix Technologies, Carrollton, Texas; David Matteson, President of Early Edge Solutions, Seattle, Washington; J.D. Weir, CEO of Primus Pharmaceuticals, Scottsdale, Arizona; and Bruce Worley Jr., the Director of Field Sales for Humphreys Pharmacal, East Hampton, Connecticut. Other members of the Natural Products Foundation board are Derek Hall, CEO of Qivana and Pat Sardell, President of the Natural Products Association. This post is taken from material posted by Marc Ullman, of the NPF Legal Advisory Council, on the NPF LinkedIn Group. FDA's has issued its first Warning Letter following a Dietary Supplement GMP inspection. You can (and should) read the Warning Letter here: fda.gov/ICECI/EnforcementActions/WarningLetters. Two very basic principles jump out. First, you must take the obligation to verify the identity of every single lot of incoming dietary ingredients through valid (as distinguished from validated) methods. Second, if something is not in writing, FDA will view it as having never happened. Natural Products Association members are invited to join NPA Vice President of Scientific and Regulatory Affairs Dr. Daniel Fabricant and CEO and Executive Director John Gay for a conference call Friday, March 5, at 2:00 p.m. ET to learn what the recently introduced Dietary Supplement Safety Act (S.3002) does, and what can be done about it. Earlier today, Senator John McCain announced the introduction of legislation concerning supplements: "The Dietary Supplement Safety Act of 2010." The FDA is currently collecting comments about the Food Additive Petitions. This measure provides that additives shall be deemed unsafe unless their use is permitted by a regulation that perscribes the condition under which it may safely be used, or unless they are exempted by regulation for investigational use. FDA is accepting comments until February 18th. At a recent briefing about the agency's new aims, Leonard Gordan, director of the northeast regional office of the FTC, warned marketers about the imminent difficulties they will face if they make unsupported health claims.